A mother came into the Cove Sunday early afternoon. With her were two little girls, very close in age. Mom sat down with some friends and what looked like an older sibling to the two in the picture. I want to tell you this story because there were two things I saw that truly impressed me and both not only made me smile but also made me realise that I was in the company of good people. The two little girls went about their business completely on their own. The took off their hats and coats, hung the coats up on the backs of the chairs then cleaned up the table, moving the serviettes, ketchup, sugar and saucer of cream from the centre of the table to make room for their business. They were quick and efficient about their chores and shortly had everything the way the wanted it. They moved the chairs up close to the table so that when they got into the chair they would be just the right distance away. 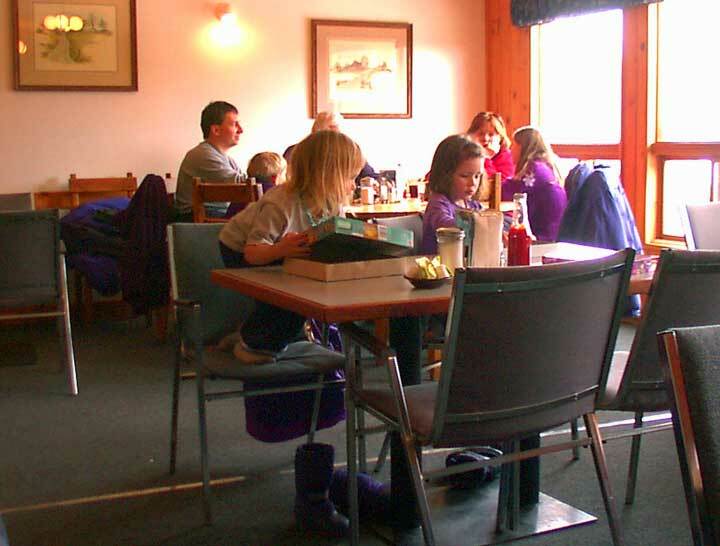 With arms on the chairs it was really hard to get up in place but the boots were off and in a flash both girls were opening the boxes they had been carrying with them when they came into the restaurant. Inside each box was a puzzle and in less time than it takes to tell you this tale they were busy assembling the puzzles. There was a little boy about their age at the table toward the window from the two with his parents but he wasn't actually at their table he was under his parents table as they were engaged in conversation he had slipped off his chair and was hiding beneath. The little girl with the darker hair spotted the fellow and pointed at him, turned to her companion and said "boy." She gestured toward him and invited him onto the chair at the end of the table and soon he too was a busy puzzle assembler. The independence and self assurance of these two little girls was fascinating, truly a credit to their parents and indeed to all who would ever see or meet them for they clearly had their lives under control and were self starters. The inclusion of the little boy in their activity was even more impressive as he was able to join in and feel part of the activity, relieving the boredom that only moments ago had seen him under the restaurant table. Had this been the only event I had seen yesterday I would have been far more than content for indeed the two little girls, the mother who had brought them to this moment in time are winners in life, but there was more to see. As we sat eating our lunch, family after family worked their way out of ski-doo suits and scarves and wrapped themselves around tables in harmony and good spirits. Enjoying each other, their surroundings and the calm that comes from enjoying oneself. Families skating, snowmobiling, cross country skiing, families sharing a winter day together. Moms and dads, aunts and uncles, little brothers, big sisters, gramma and grampa, the park and these fabulous outdoor surroundings had drawn them here and given them this time together. It must be five years now since one afternoon we stopped to take some pictures of some folks ice fishing out on the lake and discovered that the ice fishing shacks were full of families, people of all ages sharing in the activity. There is that simple concept that some things done well appear to be magical, indeed the activities we saw around the park Sunday held within them a touch of magic.